The historic Woodstock Inn & Resort, in the quintessentially New England village of Woodstock, is opening a Tubbs Snowshoes Adventure Center this winter to offer new outdoor activities for guests. Tubbs Snowshoes is opening its first Tubbs Snowshoes Adventure Center at The historic Woodstock Inn & Resort, in the quintessentially New England village of Woodstock this winter, adding a whole new dimension of outdoor activities for guests. Woodstock Inn already offers skiing on its own Suicide Six mountain (despite the name, is very family-friendly), and cross-country skiing. Tubbs Snowshoes has deep roots in New England from its founding in Maine in the early 1900’s and its previous World Headquarters in Vermont, before relocating to Seattle, WA, in 2003. The Tubbs Snowshoes Adventure Center will feature expert-led tours, group teambuilding exercises, and family-friendly scavenger hunts. Enhanced experiences are also available, including special moonlight treks for dinner in the resort’s cozy cabin in the Marsh-Billings-Rockefeller National Historical Park. Beginners and experts alike will find the Tubbs Snowshoes Adventure Center and 30 kilometers of trails challenging yet comfortable and relaxing against the backdrop of the Resort’s expansive grounds. Woodstock Inn & Resort has designed a series of winter adventure-themed vacation packages built around the Tubbs Snowshoes Adventure Center. From romantic to adventurous, the value-packed getaways are designed for an exhilarating way to experience the peace and tranquility of Woodstock in winter. Certified Tubbs Snowshoes instructors and guides will be onsite at the Tubbs Snowshoes Adventure Center to lead tours for beginners to advanced outdoor explorers. They will also offer snowshoe fittings for guests purchasing the latest Tubbs snowshoes from the on-site ski shop. Trail passes, rentals and lessons will also be available. Located in idyllic Woodstock, Vermont, The Woodstock Inn & Resort defines country sophistication in one of New England’s most charming and popular year-round vacation destinations. The 142-room, AAA Four Diamond Resort and member of Preferred Hotels & Resorts, offers award-winning dining in two restaurants, ranked among the finest in New England. The Woodstock Inn & Resort is owned and operated by The Woodstock Foundation, Inc. Proceeds from Resort operations support The Woodstock Foundation and Billings Farm & Museum education and conservation programs. For more information on the Tubbs Snowshoes Adventure Center, including detailed vacation packages, visit www.woodstockinn.com. For information on the latest collection of Tubbs Snowshoes, visit tubbssnowshoes.com. Twin Farms, an intimate country hideaway and a five star Relais & Chateaux Resort, is an ideal retreat for art and design lovers, romantics and gourmets. 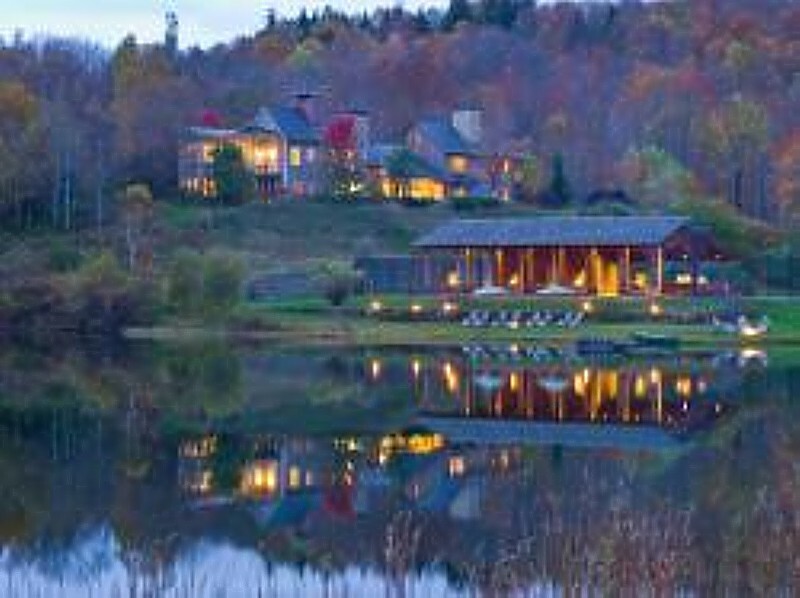 Twin Farms, an intimate country hideaway, set amidst 300 acres of meadows and woodlands in an unspoiled valley, just 15 minutes north of Woodstock, in Barnard, Vermont, is an ideal retreat for art and design lovers, romantics and gourmets. Originally the home of the writer and Nobel Prize winner Sinclair Lewis, the five star Relais & Chateaux Resort provides 20 lovely rooms in 10 freestanding cottages. In 1993, Jed Johnson, interior designer and friend of the famous artist Andy Warhol, designed 15 rooms, before Peter Bohlin and interior designer Thad Hayes completed the rest in 2005. A special combination of American folk and contemporary art gives Twin Farms its special charm. Decorative ceramics are mixed with originals by Roy Lichtenstein, Jasper Johns and David Hockney, among others, while fine woodwork made of maple and pine relate with modern sculptures. Gourmets will appreciate the elegant and authentic cuisine at The Main House restaurant. Chef Nathan Rich’s dishes reflect the seasons and are prepared with ingredients from the garden or from the nearby region. The wine cellar, consisting of 26,000 bottles of fine wine of international origin, completes the taste experience. Nathan Rich was honored last year as one of the world’s only three chefs with the award “Relais & Chateaux Rising Chef Trophy 2013”. At the “Spa at Twin Farms,” guests can indulge in relaxing massages or enjoy a workout in the fully-equipped fitness center. The Spa menu offers tailor-made spa treatments, luxurious facials, rejuvenating pedicures and manicures as well as exquisite body treatments. All Spa products are handmade Vermont and contain only herbal extracts, organic herbal teas and pure essential oils. Summer and winter, there is a lot to do, whether hiking, climbing, fishing, canoeing, skiing or ice skating. Accommodations start at $ 1,450 for two people. The price includes all meals, drinks, cocktails, wine and the use of the spa area including the Furo – a 104 degree Japanese style soaking tub – as well as the use of recreational equipment such as canoes and fishing tackle. Twin Farms, P.O. Box 115, Barnard, Vermont 05031, 802-234-9999, info@twinfarms.com, www.twinfarms.com.